Marie-Constance doesn’t find her friend’s idea such a bad one, and soon enough she’s at the office of the local newspaper, paying the fee to have a small ad inserted in the local newspaper – and then she waits. The harder Marie-Constance tries to be good, the more things go wrong, and in a town as small as hers word soon gets around. Accused of disturbing the peace, the police soon become involved, even if they’re not exactly sure what she’s done wrong. In truth, her transgressions are of the social variety, practicing aloud what most believe should be done silently. The truth, though, is that Marie-Constance is just too charismatic to be a simple reading machine – beautiful, engaging and seductive, she’s a woman who wants to be involved with the world. Very quickly, she finds herself drawn into her clients’ lives, and they’re all to eager to be a part of hers. It’s a subtle reminder of the hypnotic power the written (and spoken) word can have. Marina Sofia – It is a shocking cover, but it was a fair bit cheaper than the other editions, so I bit the bullet and bought it 😉 While I prefer the Peirene cover, I always try to read their French- & German-language books in the original (still looking for a cheap copy of one of them, though!). Marina Sofia – Luckily, the Book Depository is fairly good for this sort of thing (Amazon is awful because of delivery charges). The book I want is expensive anyway as I think it’s no longer in print (or never had a paperback run). Tony, je suis curieuse, quel livre tu cherches? ‘La compagnie des Tripolitaines’ (AKA Peirene 15 – ‘Under the Tripoli Sky’) – le livre existe, mais il coûte un peu trop cher pour moi (AU$33 pour un livre que je lirais en une heure!). 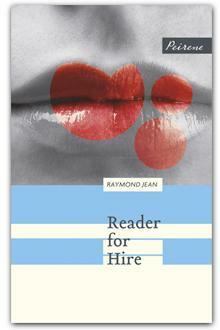 Much prefer the subtle Peirene cover … and like you found it a fun read. I haven’t read this year’s Peirene titles yet (last year I read all three in a row; perhaps the same will happen again) but the two so far seem very different from each other. I must admit I find their books already quite varied, but the fact that this is different again is even more intriguing. I love the premise. I’m totally curious about this one, really. It’s a nice change from the usual white male mid-life crisis. PS: I’ve discovered that the French post has special cheap tariffs to send books abroad, contact me if you need something. This book sounds so interesting. I can’t help but think how many different directions this premise could go . Would be interesting to give this theme to several author’s and see what they come up with. Enjoyed the review.